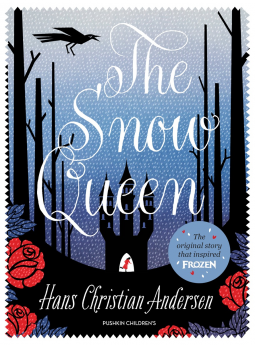 Presenting The Snow Queen by Hans Christian Andersen. When Kay is cursed by a magic mirror, he can no longer perceive goodness in anything - not his best friend Gerda, nor the roses in the garden. One wintery evening, he is kidnapped by the wicked Snow Queen and swept away to live for ever in her kingdom of ice. Friendless and shoe-less, Gerda must travel through inhospitable lands, with only crows to guide her and bandits for company, in order to find her beloved friend. And when she gets there, how will she melt the ice in his heart? Nearly two centuries after its first publication, The Snow Queenendures as a tale of love and loss, good and evil, and loyalty in the face of great hardships. It has been years since I read The Snow Queen, so I was pretty glad for this re-reading experience. This is one of Hans Christian Andersen;s most famous fairytales and also one of the longest and the most complex one too. Frankly, this was really not my favorite but I enjoyed it nonetheless. And this one has got some pretty great artwork preceding each of the chapters. This is the story of Kai and Gerda (don't know if its a mistake but the synopsis says his name is Kay), best friends really. This is the story of sacrificial love and themes of growing up but still remaining children at heart. This is the story of Kai whose heart got pierced by the demon's mirror and got kidnapped in turn by the icy Snow Queen, forgetting everyone and everything .... even Gerda. This is the story of Gerda who would go to the ends of the Earth to rescue her best friend. And this is the story of Gerda growing up through said quest. With vivid imagery, Christian themes and myths and lore combined, The Snow Queen is a complex and rich tale to be sure. Enjoyed by all of the young and the old. I just think that of the book had annotations and discussion questions and answers at the end alongside all the beautiful artwork then maybe this book would have been a compound experience. "A marvelous edition and a marvelous fairytale"